Our price is $1,299 (includes FREE ground shipping in USA). Promo price valid for 6 more days. Our price is $1,845 (includes FREE ground shipping in USA). Our price is $795 (includes FREE ground shipping in USA). Our price is $845 (includes FREE ground shipping in USA). Our price is $1,325 (includes FREE ground shipping in USA). Ground shipping is FREE within the USA! Need faster shipping? You can select expedited FedEx shipping during checkout. All items ship for one low price, no matter how many products are ordered. Found a lower price somewhere else? We doubt you will. However, if you find a lower price before placing your order, please contact us via phone or e-mail if you do! 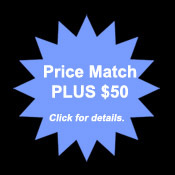 We will beat any other price from Ultimatte Authorized Resellers. Quite simply, our goal is to offer the lowest prices for the Ultimatte AdvantEdge and Ultimatte RT software plugin available anywhere. Need the versions for SGI, IRIX, or Linux? Please contact us. We also offer these versions of software at lower prices than anywhere else. Ground shipping is FREE to the USA!!! If you have any questions about shipping rates, please feel free to call or e-mail. Please note that we DO NOT offer refunds for Ultimatte AdvantEdge or Ultimatte RT software. Should the CD or USB security key be damaged, we will EXCHANGE the defective item as soon as possible. If you are concerned about the NO REFUND policy because you are not sure whether the software is right for you, we encourage you to download the full working version of the Ultimatte AdvantEdge and/or Ultimatte RT plugin (output is watermarked) and the full manual. The downloaded version works the same as the licensed version, but the non-licensed version has watermarks on the output. After installing the USB security key, further output from the Ultimatte software will no longer be watermarked. We accept Visa, MasterCard, American Express, Discover, and PayPal via our secure ordering site. After you select your items, the shopping cart will enable you to enter all of your information via our secure shopping cart system. The shopping cart used will list Virtualsets.com, Inc. on top. Virtualsets.com, Inc. is the parent company of www.Ultimatte-Software.com. All content ©2007-2013 Ultimatte Corporation or Virtualsets.com, Inc. All rights reserved.